As mentioned in a previous article, horticultural crops that are grown in light greenhouses without great environmental control in our southern coastal areas such as Almería, Costa de Granada and Málaga, should be stimulated in the autumn and winter months to reinforce everything, especially fruits development. Otros cultivos también se encuentran en fases más o menos avanzadas de producción (berenjena, pepino, calabacín) y todos se pueden beneficiar de un complemento a la fertilización en las condiciones descritas para mantener la producción y la calidad. Under current conditions and speaking about the second group, PLYMAG offers stimulants and bionutrients that on the one hand, improve fruits development (caliber) and contribute to plant vigor. FORTYMAG(foliar): Stimulates fruits development (fattening). In crops such as zucchini, cucumber and beans, it favors the fruit proper formation and its greater length. These products can be applied in crops of the first group, provided that ripening is not advanced and there are fruits in development phase. in next paragraph, there is more detailed information about ROMBIENZIM. FORTYMAG was treated in the previous article. ROMBIENZIM Power basic physiological processes of plant through iron formulation with amino acids and enzymes obtained in a delicate process of enzymatic fermentation controlled. It will be applied in fertirrigation during fruit development stage, regulary or when there is a large fruit bearing or when you want to take advantage, due to market positive circumstances. Quick results taking advantage of the opportunities offered by vegetables market out of season. Dynamization of root activity with direct effect on flowering, and subsequent fruits development. Application by irrigation and very tight product consumption. In this way foliar applications are avoided that can be undesirable in certain conditions (short and cold days, with risk of fungal or bacterial attacks incidence). In this case we talk about tomato and pepper, preferably, but also aubergine, with the aim of improving fruits ripening conditions, its consistency and organoleptic quality. ROMBICAL (by irrigation): provides nitrogen free calcium, which in advanced maturation stages can harm quality, combating possible potassium excesses while preventing physiopathies related to calcium and excessive salinity. KMAG (by irrigation): provides a high concentration of potassium in an advanced formulation with sulfur. This product is ideal to improve fruits “filling” and consistency, and its formulation is beneficial in basic or saline soils. Its use favors bulb acidification and trace elements solubilization, as well as phosphorus. Provides a high concentration of calcium complexed by acetic acid and chelated with EDTA, for use both in mechanized irrigation (localized or aspersion), and by foliar. ROMBICAL does not contain N, so it does not delay ripening or favors diseases. Calcium plays an important role in cell division, in wall cell formation and its structural integrity. All these processes are important during fruit development, which is sensitive to scarce calcium mobility and osmotic imbalances that have a direct impact in physiopathies. 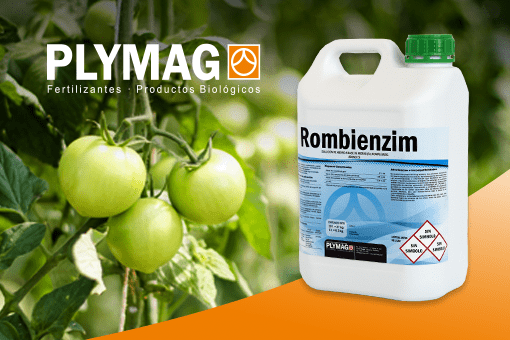 ROMBICAL, with a high concentration of calcium, perfect solubility and high availability represents an ideal tool to prevent and correct deficiencies of this element and improve the consistency and fruits quality. Especially indicated when you want to provide a fully soluble and highly assimilable calcium without providing N.
Physiopathies reduction related to calcium and reduce production losses caused by fruits affected by these physiopathies. Improved strength and quality of the fruit as they have consistently brighter and thicker walls and skin, better adapted to handle and transport.Mejor comportamiento de la planta en condiciones salinas. Special aptitude for its use in saline and / or alkaline soils, thanks to its sulfur content which favors bulb acidification and micro nutrition efficiency. (basic pH conditions). Ideal complement to enhance fruits quality (weight, size) and ripening. It positively sway production quality and in particular fruit shape, color and flavor, favoring ripening, although it is vital throughout crop cycle. It has a role as a nutrient (make easy the synthesis of proteins and enzymes) and besides has another role as an improver in saline soils. Its acidifying effect benefits micronutrients assimilation at alkaline soils (iron, manganese). KMAG must be applied in fertigation during fruit development especially to promote weight and quality (content of soluble solids) and, finally, ripening. KMAG favors reserves accumulation in organs such as tubers or bulbs and therefore favors production, quality and conservation of the same. Better quality and harvest conservation. Contributes to control salinity negative effects, by not carrying salts susceptible to remain in the soil solution and thanks to sulfur effect. ¡Plymag web site features a novel image and many new innovations! !